Kansai International Airport – Bangkok Airport. Bangkok Airport – Vientiane – Luang Prabang. After arriving in Luang Prabang, as part of a survey on the use of eco-resources, visited places in the city where eco-resources were being used. Visited places in Luang Prabang where eco- resources were being used, in particular the fresh food market and Ban Phanom Village, where there are weavers using non timber forest products. In the evening, returned to Vientiane. Luang Prbang – Vientiane. In preparation for the workshop to be held at the Department of Forestry of the National University of Laos on March 16, visited the Faculty of Forestry, Faculty of Agriculture of the university, and the Living Aquatic Resources Research Center (LARReC) of the National Agriculture and Forestry Research Institute (NAFRI). Participated in and gave a lecture at the workshop held at the Faculty of Forestry of the National University of Laos. Vientiane – Bangkok Airport – Kansai Airport. During the visit to Vientiane, I heard progress reports from Mr. KOSAKA Yasuyuki (enrolled in 2000, research theme: changes in forests), Ms. YOSHIDA Kayoko (enrolled in 2001, research theme: political science) and JSPS research fellow Dr. UBUKATA Fumikazu (research theme: forest management) at the 21st Century COE office, and from Mr. MUSHIAKI Etsuo (CSEAS research fellow) at the Faculty of Agriculture of the National University of Laos. The purpose of the workshop held on March 16 at the Faculty of Forestry of the National University of Laos was: (1) to explain the development of our research in Laos from the initial stage until today; (2) to present the outcomes of the research that we carried out with support from the Toyota Foundation; (3) to present the outcomes of research making use of the 21st Century COE field station; and (4) on this basis, to refer to the potential for future joint research. From Japan, the participants were three faculty members from ASAFAS (Profs. HIRAMATSU Kozo, TAKEDA Shinya, and myself), Prof. KOBAYASHI Shinya (Kobe University), three ASAFAS graduate students (KOSAKA, YOSHIDA and Anoulom Vilayphone, who is also an instructor at the Faculty of Forestry of the National University of Laos), Mr. MUSHIAKI Etsuo (CSEAS research fellow) and Ms. KIGUCHI Yuka from Mekong Watch, an NGO. On the Laos side, there were twelve participants from Lao P.D.R.,Mr. Soukkongseng Saignaleuth, Dean of the Faculty of Forestry of the National University of Laos, Mr. Khamlek Xaydara, Chair and Mr. So Vue, Vice-Chair of Department of Forestry Management, the Faculty of Forestry of the National University of Laos, and Secretary General Mr. Savat Wongphila, as well as Mr. Somboon from LARReC. Unfortunately, two people who were scheduled to attend, including the vice-dean of the Faculty of Agriculture of the National University of Laos, were unable to make it. Of the six presentations, two were made by ASAFAS graduate students (Mrs. KOSAKA and Anoulom Vilayphone), and the workshop thus made a major contribution to on-site education. An exchange of views on joint research was held with Dean Thongphanh Kousonsavath and Vice-Dean Thongly Xayachack of the Faculty of Agriculture, National University of Laos. It was decided to carry out joint research centering around three topics: fisheries, rural development, and the collection of agricultural implements, and to include Savannakhet Province in the southern part of the country in the survey area along with the area around Nabong, in Vientiane. For detailed information on the contents of the joint research with the Faculty of Forestry of the National University of Laos, please see the report by Dr. TAKEDA. Although the visit was a short one, I conducted a survey on the use of eco- resources in Luang Prabang in the north of the country. In particular with regard to aquatic resources, I found differences in body size compared to similar species in the center and south of the country. 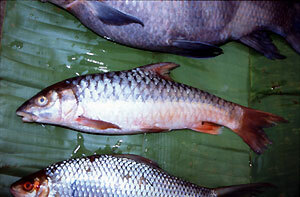 In addition, I found species of fish that do not exist or are hardly ever found now in the center and south. There is a need for further considration of the possibility of establishing a field station in the area of Savannakhet. 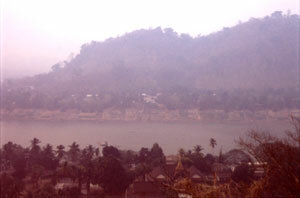 The Mekong River seen from Phou Si, a hill in the center of Luang Prabang. In the foreground is the roof of the Royal Palace Museum. The background looks hazy because of smoke rising from shifting cultivation. Fish being sold in the morning market in Luang Prabang. This is a kind of Bagarius, from the catfish family. 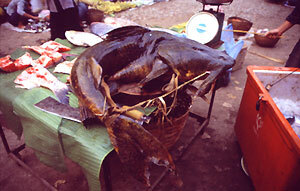 Locally, it’s called a “crocodile fish.” Recently, it has become very rare in southern Laos. Tor laterivittatus, a member of CYPRINIFORMES that thrives in flowing rivers with rocky beds (center of the photo). This species is not found in the plains area of southern Laos. The photo was taken at the Luang Prabang morning market. Not all aquatic resources are fish. 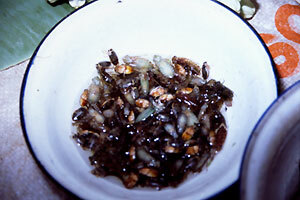 Insects are also an important source of protein. The photo shows a type of diving beetle and dragonfly larvae. It was taken at the Luang Prabang morning market.